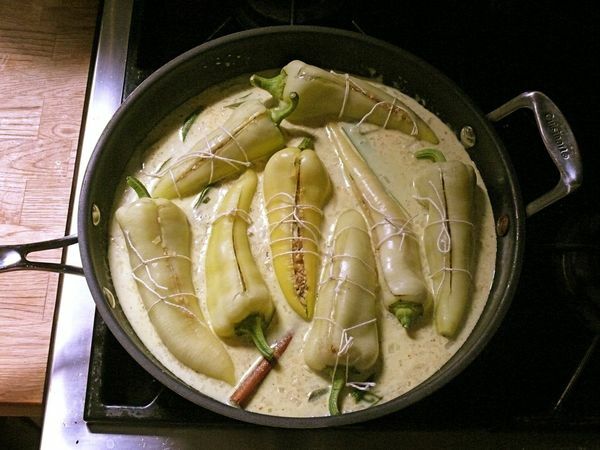 I finally know how to make something that I used to have to wait for a special occasion to request–my aunt’s stuffed banana peppers. Sadly, I think learning how might have been a mistake. Why did it only occur to me now that part of the allure of eating this was knowing that my aunt was making this especially for me, that I’d walk into her apartment and the aroma and spice in the air would greet me just in advance of her, and that the love and experience she brought to this can’t be accounted for in a recipe? I find myself doing this a lot. Investigating too closely, messing with perfectly mysterious magic. At least you don’t have to worry about messing up a good thing. 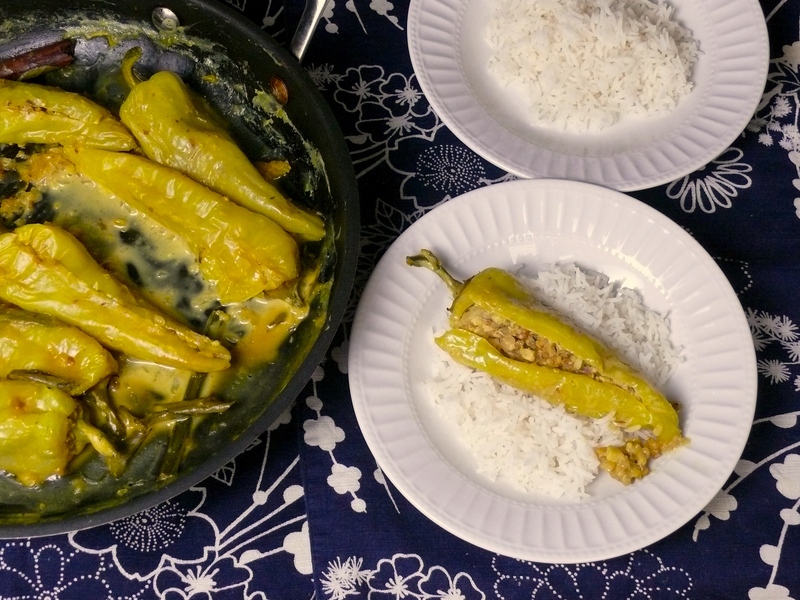 You’ve never had my aunt’s stuffed banana peppers, so if you try this recipe, you have nothing to lose and only seriously great things to gain. The flavour that the chilies bring, and the fact that this is a white curry, might make it different than one you’ve tried before. White curries are wonderful and this one is completely satisfying. If you like heat, this dish has got that, but if you don’t, you can substitute a mild yellow pepper for the banana chilies. The flesh of the chilies is soft but the filling has bite. 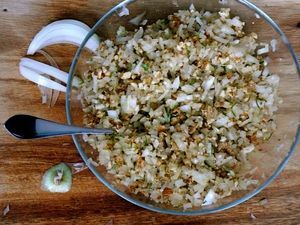 The onions are sweet and the sauce is fragrant and savoury. I find that sometimes the thing you’re stuffing takes a back seat to the stuffing itself, but not here. 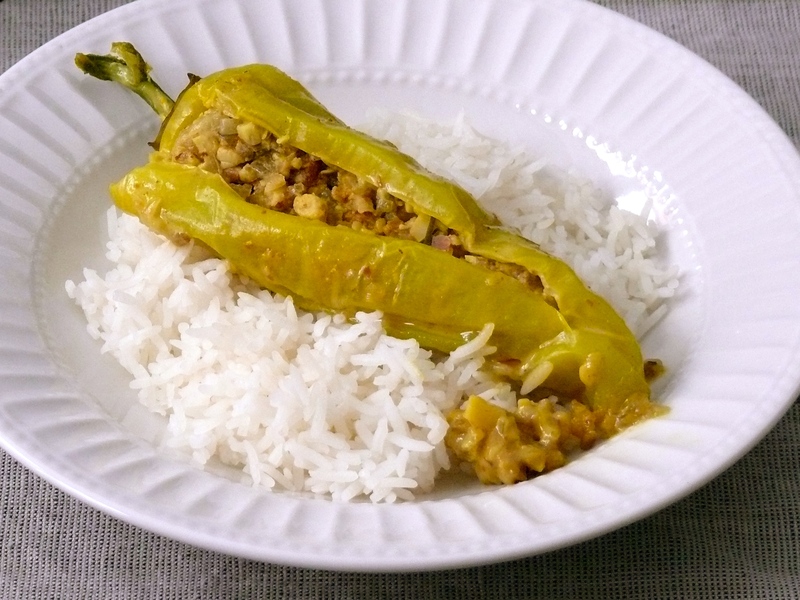 You’ll enjoy the sauce, filling and chilies in equal measure, and though you could serve this with other curries or sides, you might want it only on a bed of hot rice. I prefer to eat it that way, to let me experience it without distraction and to tame a little of the intense heat that at least one of the chilies (I’ll consume serveral a sitting) will ineveitably bring. 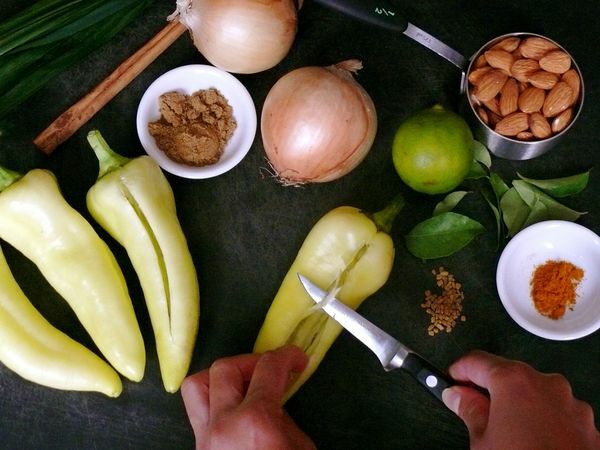 Sometimes recipes almost jump out of the screen and call out to you, begging to be made. Well, this was one of them. I have been thinking of making it for 2 weeks now and I made it for lunch today. Next time I think i will use 20 chilies since I can’t stop eating them, neither can my husband. We choose slightly smaller and hotter chilies (since we are complete chili fiends) and hence did not even need to tie the chilies up). This is a party keeper. samarpita, thank you so much for the nice words. i love that you opted for even hotter chilies! 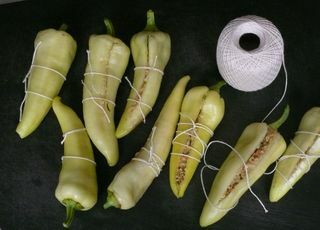 and what a great tip that smaller ones don’t even need to be tied–i must try that. thanks for trying the recipe and for your feedback. that’s great! please let me know how it turns out. i pour the curry over the rice. i love rice at the end of a meal that is soaked with all the flavours from whatever was on top–that’s the best part to me–but dipping bread or roti into it sounds like a lovely idea too. enjoy!